The BOB Sport Utility Stroller is perfect for adventures off the beaten path. No pavement? No problem. This rugged stroller, with a fixed front wheel for added stability, is the best travel companion for parents who prefer the great outdoors. The Sport Utility Stroller has pneumatic knobby tires on high-impact polymer, so rough trails are no sweat, and a hand brake for added downhill control. Plus, it has simple two-step folding that makes for lightning-quick transport and storage. And the Sport Utility Stroller goes above and beyond with a state-of-the-art adjustable suspension system that easily tackles any bumps that come your way. This latest model comes with perks like an adjustable handlebar to fit parents of any height, a larger storage basket and improved quick-release front and back wheels. The seat reclines with a simple push of a button or you can position it fully upright so your little adventurer can take in the world. Combine the Sport Utility Stroller with an infant car seat, like the BOB B-Safe 35 by Britax, to create the best travel system for your lifestyle. So fill up a water bottle. Lace up those sneakers. Your next off-road adventure awaits with the Sport Utility Stroller. BOB, the #1 jogging stroller. 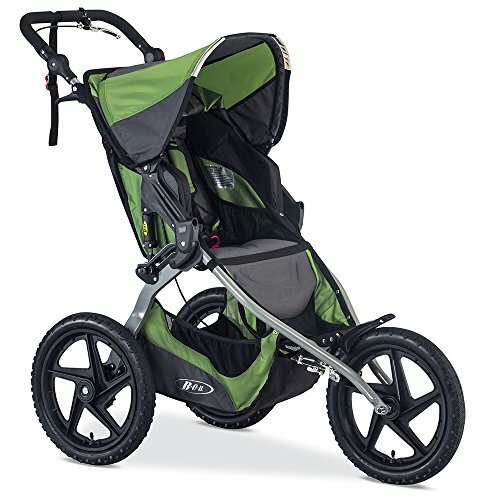 16" knobby, air-filled tires on high-impact polymer wheels mean that this stroller is built to handle all your trail adventures.